What's terrific about this picture book is that it introduces children to different nutritious foods (fruit and vegetables) according to their colours. It is also terrific to use as a mentor text to reinforce learning about adjectives. It introduces students to traditional fruits and vegetables, but also traditional Australian Indigenous foods. 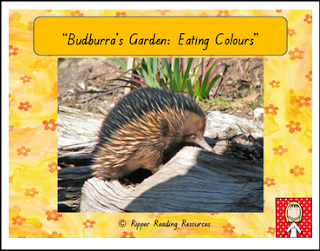 The picture book includes information about the bush tucker found in "Budburra's Garden" at the back of the book and recipes to "Colour Yourself Healthy". I really think this is a powerful picture book with potential to be used on many levels. All resources are for personal/classroom use only and are not to be distributed further. Multiple licenses are now available at TpT for half price. No sharing of this resource is permitted through email, photocopying, internet groups/blogs, offline groups, school district or regional websites/servers,discussion lists, school websites/servers, or personal websites.